Dallas-born artist and documentary film maker James Dowell (left) and New York-based film maker John Kolomvakis have a screening of their feature documentary, Ned Rorem: Word & Music at 8pm on Monday March 30 at the Lyric Theater, Murchison Performing Arts Center on the UNT campus. Not familiar with Ned Rorem? Neither was I, sad to say. But we need to be, just as we need to know the work of these two extraordinary film makers. Dowell's core audience is in New York and San Francisco, he admits, where Rorem is a cult hero of sorts. While Dowell's work hasn't gotten much attention in his hometown, the film debuted to critical acclaim at Lincoln Center in New York last year. Ned Rorem is a Pulitzer Prize-winning composer and a diarist who has been described by Time magazine as "the leading American composer of Art Songs". His numerous diaries constitute one of the most intimate records of the interconnection of gay culture with the larger musical and art worlds. Tim Page, the noted critic for the Washington Post and NPR, has described Rorem’s Nantucket Diaries as, “the earliest and most evocative (account) of the early years of the AIDS epidemic.” We are also given a picture in the diaries of the haute music and art worlds of Paris and New York from the late 1940's to the present. As the subject of Ned Rorem: Word & Music he brings a compelling body of music and also a wide range of cultural experience to this endeavor, which has been filmed from 1994 to 2004. 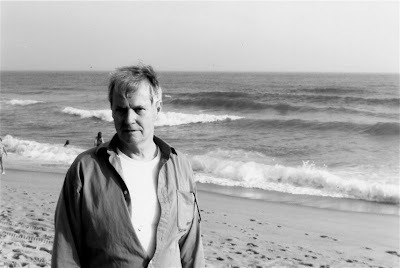 Rorem, photographed in Nantuckett by Dowell. 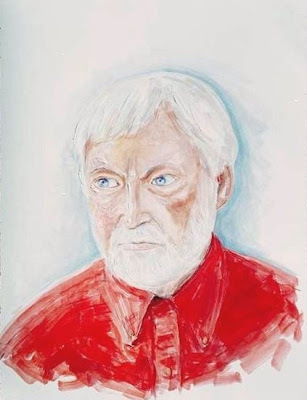 Rorem, as painted during the filming of the documentary, by Dowell. The film took 10 years to make. "In the context of the film, you see people changing. You see us changing," Dowell told me by phone from the house on Desco where he grew up, and which he recently inherited after his father passed away. "Rorem was in his early 70s when we started filming, and by the time we finished he was 81. He's 86 now. "....one of the things we had no idea would happen with Ned during the filming, his longtime companion contracted AIDS, and died. It was devastating for Ned, and for us. We had no idea how to deal with it in the movie, as it fell toward the end of the chronology. We didn't want to end on such a sad note. The film needed something to recover. Then we had our solution. The Van Cliburn Foundation did a tribute to Ned in Dallas, and performed one of his song cycles. Ned came for that, and they had an 81st birthday party for him. So, the film begins in Nantuckett, but then ends in Dallas for the party. We finished the film with this scene. You see him presented with a birthday cake. It was upbeat, sort of life goes on." One of the things I find so fascinating about Dowell and Kolomvakis' work is how interwoven and serendipitous it is. They met Rorem through the brilliant Pop Art poet Charles Henri Ford, whom they were also making a documentary about, called Sleep in a Nest of Flames. (That one also took about 10 years). Charles Henri Ford, as photographed by Cecil Beaton. In 1992, on a trip to Crete, we found a group of books by the side of a deserted road; abandoned now, they had belonged to an American writer who lived in Greece. Among the many literary volumes in these stacks, was a book of Pop Art poems by Charles Henri Ford, a friend of the writer. This book led us to a meeting with Charles in New York and he, in turn, told us a story that would give us a view onto a special part of the century that has just passed. ... Ford, co- author of The Young and Evil and the subject of Sleep in a Nest of Flames has been a poet and gadfly of the world of art and letters over the last 70 years. He has inhabited those worlds with the great and grand, but has kept the sharp needle of his wit polished and close at hand. The Young and Evil, which he co-authored with Parker Tyler in 1931, depicts their life in Greenwich Village. It was one of the first novels that dealt with gay characters in a nonjudgmental way and was a cause célèbre for a whole circle of bohemian modernists. Published in Paris, it was banned in both the United States and Great Britain. Our film dramatizes one chapter of this controversial novel, in which the characters represent Charles and Parker as they tweak the nose of conventional morality and explore with quicksilver prose the line between poetry and high camp. Its publication was an event in the underground, but only a prelude to a life lived in the avant-garde. Ford spent the 1930's in the Paris of Gertrude Stein. The glittering circle into which he was introduced included the modernist writer Djuna Barnes with whom he had an affair..." and on and on -- go here to read the rest. During the making of Sleep in a Nest of Flames, Dowell decided to paint Charles Henri Ford and film it. 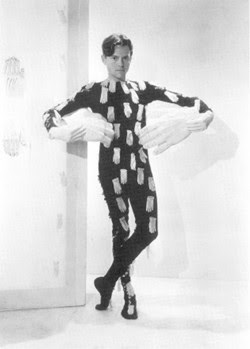 The idea started a trend, and he decided to paint Ned Rorem too. Charles Henri Ford, as painted by Dowell. Check out Dowell's website. It's a little confusing to navigate, but well worth the effort once you figure out how he's got it organized. Click on everything. Dowell and Kolomvaski are currently working on a documentary about the playwright Edward Albee which he thinks will be finished in another six months or so. The idea to do a documentary came about, naturally, because Rorem is a good friend of Albee's. They've definitely got a Six Degrees of Separation thing going on, don't they? If you can't make it out to UNT on Monday to watch the film, you can buy a copy from Dowell, who says to email him at symbiosisfilms@msn.com, or call him at 214-368-4420 and he'll arrange it.